In this post we discuss two of the most popular design styles to date, together with some tips when implementing them for your website. The use of card-style architecture in website design has been around for a while and is very popular with responsive frameworks (i.e., websites that adapt to different screen sizes). The idea is to present a large amount of information in an easy-to-digest format. Each boxed piece of content represents a unique bit of information. Most social media giants use this card style including Facebook, Pinterest and Twitter to name a few. Large amounts of content are easily seen and understood. Make sure to use plenty of white space so individual elements stand out. Imagery is very important in card design. Use high-quality images that attract users to it. Each card should focus on a single piece of information or content. Simple and easy-to-read typography works best. Use a grid to ensure that content realigns smoothly no matter what device it’s viewed. A good way to do this is by using masonry layout which allows your cards to still look great even if they are of varying size. For more information on cards and how to implement card style on your website, check out this post from Design Shack. The long scrolling format (or “infinite scroll”) has also been around for some time, and though many (including us) were wary of it because of its SEO drawbacks, it is become more popular now with the increase of smartphone and tablet usage. Long-scrolling is basically one big homepage that links to other smaller pages, often telling a story with the aid of scroll-triggered animation. The whole website can appear as a single long page aided by infinite scroll. 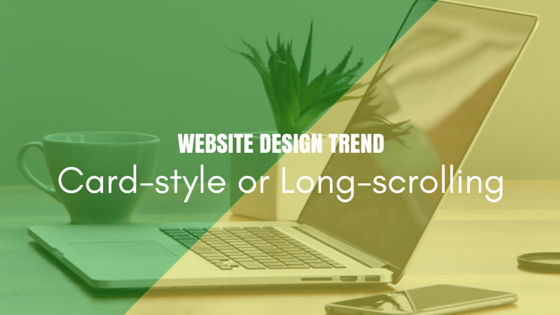 Like any other website design style, long-scrolling has its pros and cons. It is important that you understand both and determine which will best convey your brand or marketing message. Yields higher interaction and conversion rate. Well-suited for mobile and responsive design. Design your page in a way that will encourage scrolling. Use visual cues to guide users on what actions to take. Make it easy and clear for users to understand how your website works and what actions they should take next. This style has always presented problems for SEO, but you can reduce them with these helpful tips from Moz. Use sticky navigation (a menu that “sticks” to the top of the screen) to make it easy for users to navigate the site instead having to scroll back to the top for menu choices. Both the card style and long scrolling has its advantages and disadvantages. The important thing to consider when deciding which style to use is to determine which will best convey your brand message while maintaining your websites goals and purpose. In using the long scrolling make it easy and clear for users to understand how your website works and what actions they should take next. Glad to read this article.